Serving Paula Deen and her brother, Bubba Hiers, with legal papers is one way for Lisa Jackson to get back at them for alleged sexual harassment and racist treatment of employees. But we think she’d be best off serving them an ice cold plate of revenge… with plenty of butter, of course. By now, we’re all familiar with the lawsuit filed against Paula Deen and her brother, Bubba Hiers, by Lisa Jackson, who claims that when she was general manager at Uncle Bubba’s Seafood and Oyster House (Deen’s restaurant), she was met with ongoing sexual harassment from both parties. She also recently added to her accusations against the siblings that they allegedly treated their African-American employees unfairly — even having them use restrooms separate from those that the Caucasian employees were permitted to use (newsflash: The Help wasn’t an educational video). Now Jackson is riding a wave of publicity following her outing of everyone’s favourite home-town gal as a potential bigot with an allegedly perverted brother; so, why not capitalize on it? Sure, a lawsuit might ultimately make her a lot of money. But you know what else would? A revenge cookbook. Lisa Jackson could release a cookbook, inspired by the artery-clogging cooking of Paula Deen, but with a dash of vengence and a pinch of vindication. 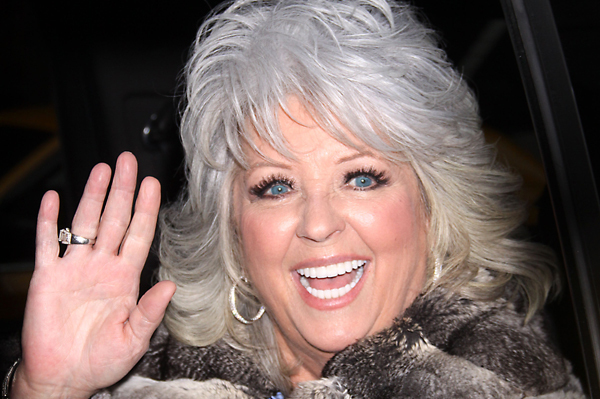 In the best of all worlds, it would be such a hit that it would cream Paula Deen’s cookbook sales. Mix in butter and milk. Lay all of the cheese onto the dough. Slice the kielbasa in two. Slam those pigs down into that cheesy dough, side by side. Wrap them up in their blanket and trap them there very tightly so they can’t go anywhere, no matter how much they try to run. Shove in the oven and bake for 15 to 20 minutes at 425 degrees F. Be sure to enjoy watching those pigs cook. Let them burn a bit if you desire. Serve and destroy — er, enjoy. Beat those egg whites until they form a disturbingly stiff peak that holds its shape every time. Beat egg yolks until all they can do is form soft peaks, in a separate bowl. Keep on beating — the butter and icing sugar this time, in a large bowl, until it yields a light and fluffy substance. Add egg yolks and vanilla to butter mixture and mix it up, stirring in nutmeg, cinnamon, allspice and eggwhites. Beat hard until well blended. Pour mix into a mug. Add some of that brandy and rum. Cut with hot water if you want. You could sure use a drink after all that beating. Oh my, it seems that the rest has been torn out. Well, you can watch the movie and figure it out.